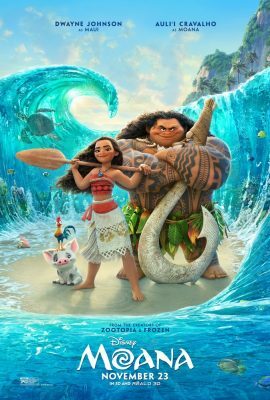 Moana is a 2016 American 3D computer-animated musical fantasy adventure film produced by Walt Disney Animation Studios. The leaps and bounds that animation has come in two decades is astounding. You have to wonder how long before the photorealistic computer generations replace the standard of actually filming something. The years of work put into Disney’s newest film stands to show their commitment to creating the most detailed and beautiful worlds possible to gawk at even if their stories can become somewhat stagnant over time. Now don’t get me wrong, the character work and themes are outstanding and combined with the visuals, it’s hard not to recommend, yet i wish the script had taken the plot further than the stereotypical fare. Following the adventure of the young woman Moana, we catch her as she dreams of leaving her tropical home and venturing past the reef that she has never seen past. Along the way she must save her world, as she knows it by working with Demi-god Maui (Dwayne Johnson) and her chicken sidekick, as they cross the ocean to their goal. Filled with heaps of heart and a lighthearted edge, the film carries a love of the Polynesian/Hawaiian mythology translating it into a spectacle, as a story of redemption and discovering one’s true purpose. Finding further momentum in giving young women a strong-willed character to look up to, directors John Musker and Ron Clements have created such a character with Moana. This isn’t the princess to be saved of yesteryear but a crafty, lovable and strong female that shatters the formula seen still too often. I wish the need to shatter what is formulaic had also been applied to the script. While the movie takes its time setting the story up, arguably the best aspect of the film comes from it’s gorgeous and thoughtful first 25 minutes, the middle chunk of the movie feels very standardized to a fault even with the likes of the great Alan Tudyk, as one of the many well designed monsters. The finale acts as a pretty well crafted send up to the story, yet I still feel somewhat let down by its simplistic plotting. This is made up for by the catchy songs that sprinkle throughout the film, with Hamilton breakout Lin Manuel Miranda both co-writing and performing many of the songs that add a really well implemented through line of discovery and hope that hasn’t been seen in many movies of late. The stunning animation alone is worth the price of admission, yet the simplistic story does leave some of the potential of the film to the imagination, if only the film had been the slightest bit more open that it could have elevated it to a higher piece of filmmaking.